Shamghadri: Comic-book-inspired action flick "300" an example of a "total lies"
TEHRAN, Iran (CNN) -- Hollywood should apologize to Iran for "insults and accusations against the Iranian nation," a top aide to Iranian President Mahmoud Ahmadinejad told a visiting Hollywood delegation Sunday. 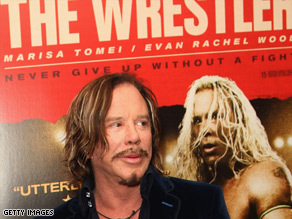 "The Wrestler," starring Mickey Rourke was also attacked for being insulting towards Iran. Oscar-nominated "American Beauty" star Annette Bening was among the members of the Academy of Motion Picture Arts and Sciences to hear the remarks, Iran's state-run ISNA news agency said. "Representatives of Iran's film industry should only have an official meeting with representatives of the Academy and Hollywood if they apologize for the insults and accusations against the Iranian nation during the past 30 years," said Javad Shamghadri, Ahmadinejad's advisor on the arts, ISNA reported. He singled out the 1991 Sally Field thriller "Not Without My Daughter," about an American woman who marries an Iranian and then tries to flee Iran with their child, and the comic-book-inspired action flick "300" as "two clear examples of total lies." Do you think an apology is warranted? TheHollywood delegation, which ISNA said also includes AMPAS president Sid Ganis, is supposed to meet with Iranian filmmakers and hold a news conference on March 7. The Academy did not immediately respond to a CNN request for comment. But Shamghadri demanded to know how the meetings could produce results. "How can we sit and have a sincere meeting with American film makers while they they humiliate and insult the Iranian people and the great revolution of this nation?" he asked, ISNA reported. "The Iranian nation and its revolution has repeatedly and undeservedly been attacked by Hollywood movies," he said. "The film "The Wrestler" is the latest among them," he said of the film for which Mickey Rourke received an Oscar nomination this year. "We know that even right now there are other films being made with the aim of insulting and accusing the great nation of Iran and its rich culture." "The Wrestler" features a character known as The Ayatollah, played by Ernest Miller, who takes on Rourke's Randy 'The Ram' Robinson.